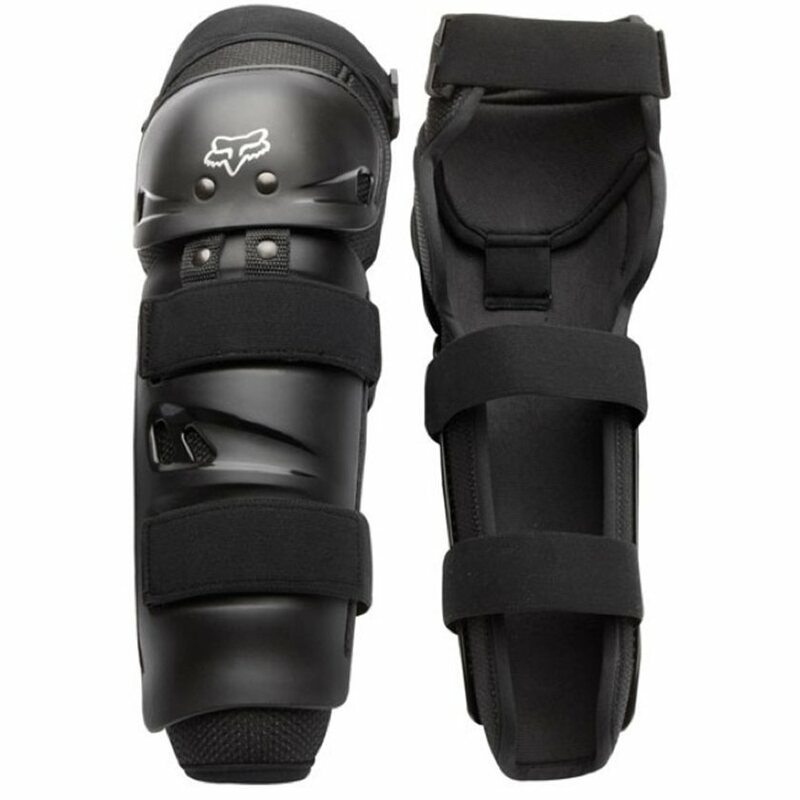 The Fox Launch Sport Knee Guards let you go big without fear of destoying your knees. The high impact exoskeloton provides coverage to vital parts without feeling too bulky.The floating inner knee hinge allows freedom of movement, while three velcro straps hold the pads securely in place. 14.5" - 15.5" 15.5" - 16.5" 16.5" - 17.5"
13.5" - 14.5" 14.5" - 15.5" 15.5" - 16.5"
having said that, there's a couple things to be aware of. the pads can get hot on long days. with cushioning all around and the hard shell, it doesn't vent in the front (the back is open tho) and when i take them off i'm always sweaty inside. i don't notice it while riding and it's not uncomfortable but something to know. i suppose you could consider it a good windbreak for your knees if you fly downhill tho. also, these don't stay put. as the day goes by i don't know if the straps get stretched or if the moisture from sweat is making them slippery but they tend to slide down or twist around your leg. to be fair, this can be said of most strap based knee pads. if this is a dealbreaker for you, you may want to look at the sleeved pads that you pull on like a sock. cons: just that its bulky. Keeps sliding down once in awhile, so need to pull up. This is a good set of pads, they only gripe is that if your wearing shorts and are pedaling while sitting, the top strap has a C shaped hook to hold the strap and it can catch on your cables. should have been put on the outside. Overall good product but not the most comfortable. Good option at this price range. Great product for the price, a little bit heavy, but for the price i dont mind that extra weight. I totally recomend this! Comfortable and provide good protection. Love the strap at the knee which keeps the knee pad in place. They are lightweight and durable. I like this guards, they are pretty affordable, might not be very lightweight but not heavy and give good protection as they cover knee and shin. The guards also have good fit, they are avilable in only one size but despite being a short guy (5'5") they fit good. Not very breathable but still I find them comfortable. Very good option. I would buy these knee guards again. Does a nice job protecting you while you mountain bike. Saved me a good knee banging the other day. I use these pads only when I am riding in rocky areas, and I didn't want to spend $50 or $60 on a set of pads that I wasn't going to wear all the time. These pads get the job done and look good. These are a great value. However, I'm not completely pleased as they straps aren't efficient in stabilizing the pad and keeping them locked in place. The coverage is great - so that I love. They do tend to retain more heat than my previous alpinestars. Ultimately if you're not having to do a lot of pumping and stay in mostly an attack downhill position they're your best bet! They did take a hard knock on my pedal and a tree first ride and they're still relatively flawless. Have only been using the product for half a season.... single track and downhill. Didn't want to splurge on anything to fancy, and this is doing the trick. Seems that once a little sweat builds up on the front of my leg, they tend to slide down a little. Easy enough to yank back up, but some of the better pads seem to have better straps. The one size fits all doesnt really work. Tried it on the trail and it slips down my leg while pedaling.